Through the summer vacation Bodleian Libraries is continuing to run its monthly session on Open Access at Oxford. Please book online by following the title link. A briefing on open access publishing and Oxford’s position including REF requirements for Open Access and ‘Act on Acceptance’; Green vs. Gold open access options; funder mandates and publisher policies; Oxford Research Archive (ORA) and Symplectic and the OA website/ helpline. Who is this session for? 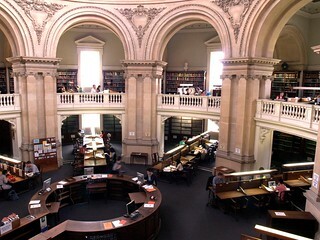 Oxford University Research support staff, administrators and librarians, researchers and academics. Publishing Oxford historians are invited to attend briefing sessions this term which are designed to update you on the HEFCE policy for the next REF and what you need to do in order to make your research output compliant. 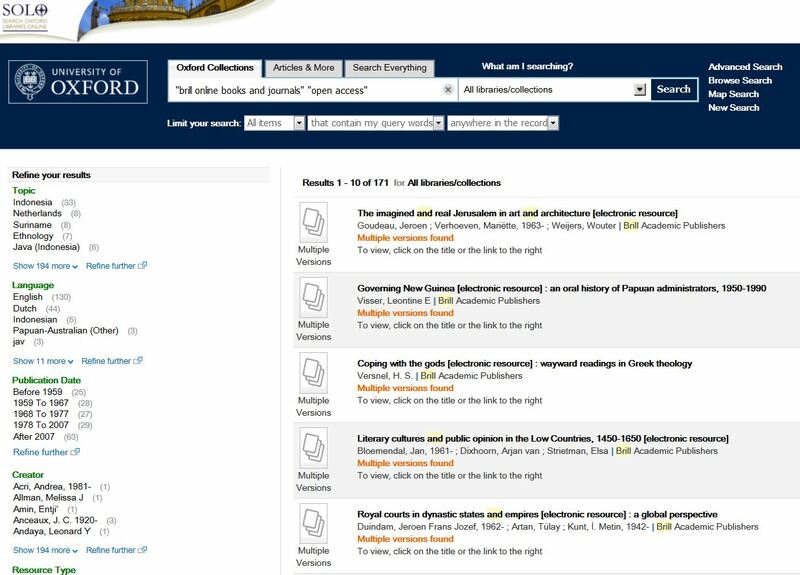 Learn about the Oxford University’s Act on Acceptance campaign and how to deposit your journal articles and conference proceedings in Symplectic. No need to sign up but bring along a laptop for some playtime if you can. 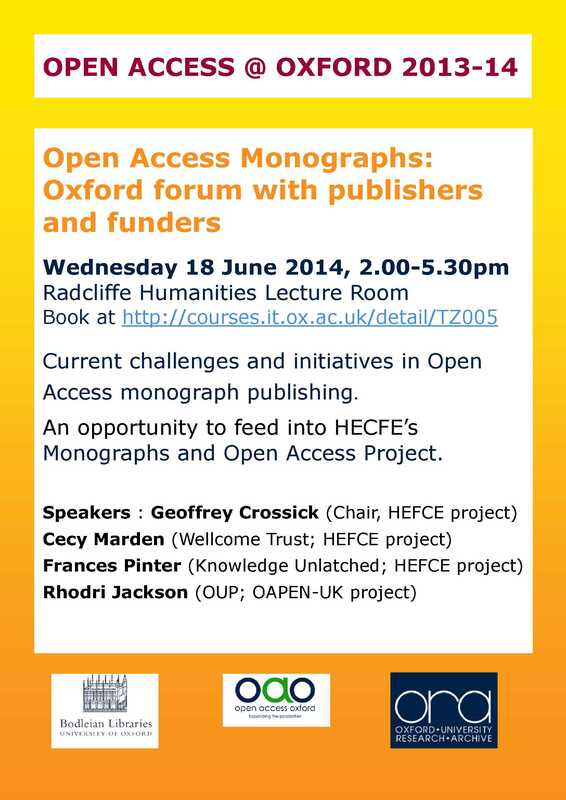 Another chance to attend the briefing on open access publishing and Oxford’s position. During the session we will cover “Green” and “Gold” routes to open access; funder mandates and publisher policies; the Oxford Research Archive (ORA) and Symplectic; the HEFCE policy on open access and how to get help via the Open Access web site and helpline. This event is free and lunch will be provided. Places are limited, please book online. 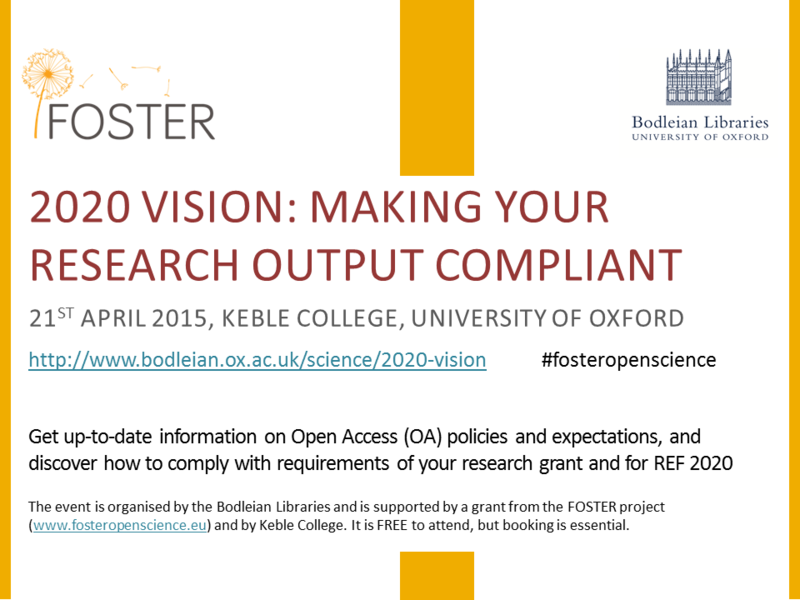 This event is designed to update graduate students and researchers at Oxford on Open Access (OA) Policy requirements and expectations with special emphasis on the practical implications for researchers. The intention is to provide information about OA Policies, how to make research compliant, and how to meet REF 2020 requirements. For enquiries about the event please contact ljilja.ristic@bodleian.ox.ac.uk. The event is supported by a grant from the FOSTER project https://www.fosteropenscience.eu/. 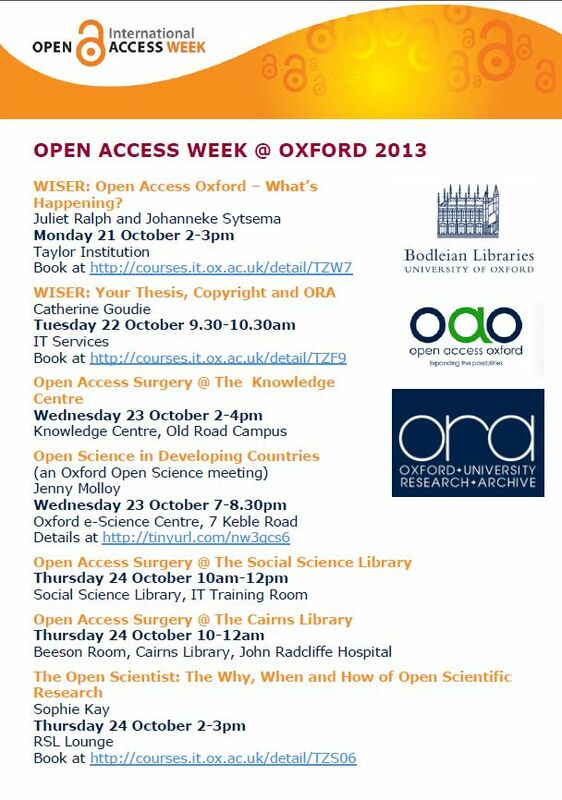 Next week the Bodleian Libraries will be running the following talks and workshops for Open Access week. These events will be of particular interest to researchers, academics and postgraduates. > book a place at any of these talks. In addition, please note that the session next Thursday (iSkills: Your thesis, copyright and ORA) is particularly relevant to DPhil students all of whom are required to deposit their thesis in the ORA repository. Dr Susanna-Assunta Sansone (Associate Director, Oxford e-Research Centre and Honorary Academic Editor, NPG Scientific Data) will speak on the rise of open data-centric research and publication enterprises. Data sharing practices in life sciences and the importance of making yours more easily reusable will also be covered. Susanna is a co-founder of BioSharing (reproducible research) and blogs about Open Data on the Guardian Higher Education Network. Who is this session for? 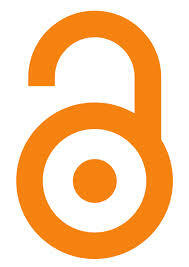 Postgraduates, academics, research staff and anyone else interested in Open Access. A briefing on open access publishing and Oxford’s position aimed particularly at researchers and academics with a funder mandate to make their publications available on an open access basis. The session will cover Green vs. Gold; funder mandates and publisher policies; Oxford Research Archive (ORA) and Symplectic; OA website/ helpline; what’s new – update on new HEFCE policy. Dr Martin Eve (Lecturer in English, University of Lincoln and OLH Co-Founder) will speak about OLH, ‘a project exploring a PLOS-style model for the humanities and social sciences’. Martin is on the JISC OAPEN-UK project committee, chief editor of Orbit, and writes about Open Access for the Guardian Higher Education Network. Oxford DPhil students are required to deposit a digital copy of their thesis in ORA (Oxford University Research Archive). Find out how to deposit the digital copy of your thesis and what you need to know about rights and other issues. Who is this session for? Doctoral research students. To book a place at any of these workshops please visit http://openaccess.ox.ac.uk/open-access-week-2014-at-oxford/. On Wednesday 18th June, there will be an opportunity for Oxford academics and researchers to debate the issues around scholarly monographs and Open Access. Both publishers and funders will be in attendance, with speakers including Geoffrey Crossick (HEFCE project, Chair), Cecy Marden (Wellcome Trust), Frances Pinter (Knowledge Unlatched) and Rhodri Jackson (OUP; OAPEN-UK project). At the end of the forum there will be a Questions and Answers panel joined by Sally Rumsey (Oxford Research Archive), which should provide for further discussion of the current challenges and initiatives in Open Access monograph publishing. It is anticipated that the dialogue of the forum will feed into HEFCE’s Monographs and Open Access project. The event will be held at the Radcliffe Humanities Lecture Room between 2-5:30pm. All are welcome, but booking is advised. For further details on the forum and securing your place, see the poster below or visit http://courses.it.ox.ac.uk/detail/TZ005. The University of Michigan’s Center for Latin American and Caribbean Studies Center for Latin American and Caribbean Studies has launched Translating the Americas (ISSN 2331-687X), a online open-access journal. The journal can be accessed here. It is also listed in SOLO and OU eJournals. Slavery in Brazil: Brazilian Scholars in the Key Interpretive Debates / Hébrard, Jean M.
O Trabalho Escravo Contemporâneo e os Usos da História / Scott, Rebecca J. Who is this session for? Research postgraduates, researchers and academics. A briefing on open access for research publications and Oxford’s position including Green vs. Gold Open Access; funder mandates and publisher policies; the Oxford Research Archive (ORA) and Symplectic and how to get help with Open Access. Who is this session for? Current Oxford research postgraduates, researchers, academics and staff. An opportunity to drop in with your Open Access queries. No need to book, just come along to one of the following venues. Our Open Access week talks and workshops are just the start of Bodleian Libraries Open Access programme. Over the course of the academic year we will be organizing talks from a variety academics, publishers and others covering a wide range of Open Access topics including Open Access in the Humanities; Open Access in drug discovery; Open Access journals; OA, impact and Altmetrics; Open Educational Resources; MOOCs; OpenData and Open Software. Watch the BodWISER blog for more details.